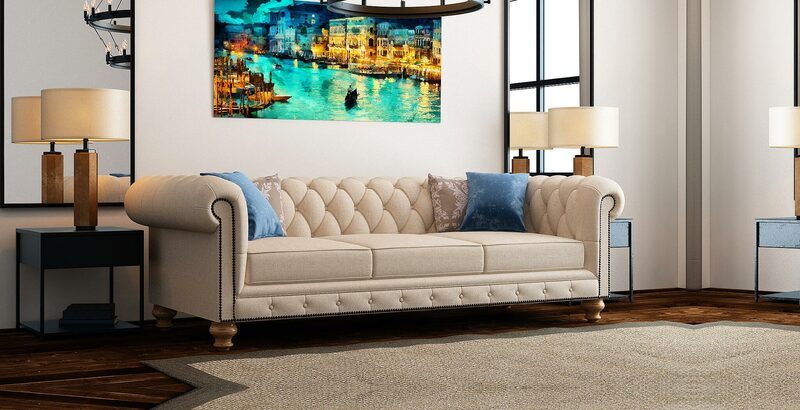 As stunning as an antique, this graceful masterpiece brings a sense of grandeur to any room. It's clean lines, and gently sensual curves are Designed in the spirit of the timeless Chesterfield style. 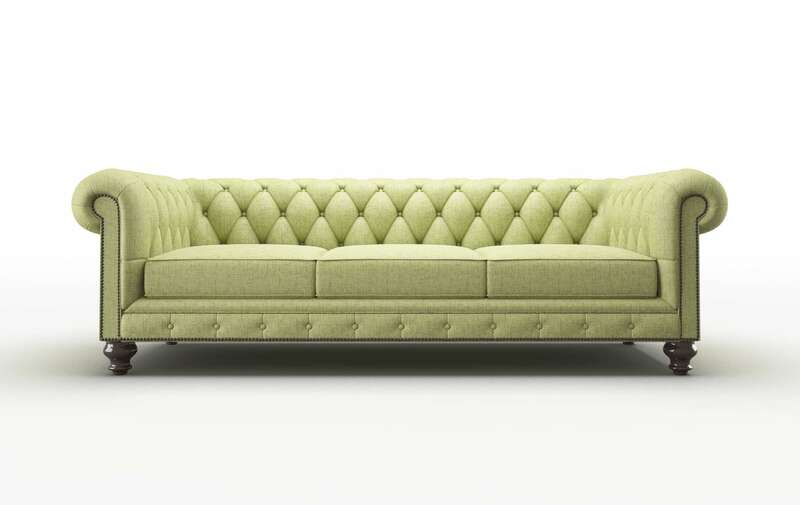 This tufted beauty is sure to become your next family heirloom. Fall under the spell of the romantic diamond tufting Bordeaux that embraces both traditional and modern flair. An inviting bench seat with grand rolled arms and vintage diamond tufting blending together to shape the ultimate modern twist on a classic. A definite keeper, its able to bring a certain softness to contemporary lines or add a vintage twist to traditional decor. The deep bench seat creates a soft but structured sit for stretching out. The high back and deep seats will create an enveloping feel and offer plenty of legroom. Vacuum regularly to keep your style looking prim, and pristine. Removable cushions allow you to Flip and Rotate cushions to ensure even wear, and increase longevity. Avoid exposing upholstered pieces to direct sunlight. Always be sure to use a clean, dry cloth, and always blot stains, and never rub. Be sure to use cleaning products that corresponds with your fabrics to keep them looking dazzling for years to come. Every aspect of Bordeaux can be customized until its simply perfect. Your style, your fabric, your fit, personalized your way. So dive in, play, design, and fall in love as you bring your dream design to life. Bordeaux is customizable to any size, or configuration. Need to create a big comfy sectional, or reduce the length by 4 inches, no problem! Use our exciting SIZEiT ™ app to Find Your Perfect Fit. With 4 stunning fabric collections, we have all you need to create something magical. 1500 gorgeous fabrics, from Perfect Pigments, Soft Sensations, Tasteful Textures, to dazzling durables, it's all the fabrics you love, all in one place. Personalize every aspect until it's perfect. Start by adding your personal touch, and choose you wood stain, select your dream nailheads, and pick your comfort level. You can even put a bed inside, if you can imagine it, we can do it. By far the best furniture store I've been too...I bought a sectional which I fully customized (chose the color, fabric, and firmness). Got it delivered a few days earlier than the estimate. One word... GORGEOUS... and I can't believe how much I paid for it! Wow! I love this place...I was able to select from a broad range of styles, specify seat depth, arm height, sofa length, and get beautiful upscale fabric--a custom, one-of-a-kind 3 piece sectional-- for less than what I paid for a rather common, mundane living room sofa and loveseat at Macys. Where to begin??? Phenomenal service, product, customer care. I recently relocated from Minnesota, leaving all of my living room furniture behind. I designed my entirely customized set of furniture that absolutely meets all of my needs and is beautiful, too! I enthusiastically recommend Rose Furniture!!! I love these guys! I had been searching for that perfect sofa without success. I wanted something that looked good and also fit my body well. The guys at Rose Furniture custom order your sofa, so it is exactly the right height, depth and length. These guys are great - it's as simple as that. I ended up buying one of the floor models which I had been eyeing at a great discount and it was delivered in just a few days. Everything worked out for the best and I am very happy! These guys are just amazing...Rose Furniture took the time to present us with options via email and responded immediately to all of our requests...I will surely come back here. Customer service here is IMPRESSIVE. This place is BEYOND fantastic! The gentleman who helped us let us know they were having a sale that weekend - and let us call in our order the next day so we could "sleep on it" We got the 3-seat couch with buttons in a gorgeous blue color, with the second-to-last firmness (yes, you get to pick how firm your couch is!). At Rose Design, the ingenuity of american craftsmanship becomes a part of your home. Beautiful styles, quality materials, and artistic craftsmanship come together to shape enchanting furniture, designed to last a lifetime. Recieve your free DreamFabric swatch and bring the showroom to you. See, touch and experience them for yourself.